Geometry Dash is a game that is developed by Pop Star LLC. for Windows 8 and 8.1. The game is based on a story where the main character is a square and it has to move forward by not touching the triangles and the other elements that come in between it to complete the level. In the game, there are no options to stop or pause the game. It is a never ending game that keeps on going until your character falls or touches the unwanted elements such as triangle. When the square hits the triangle or falls, the game ends. As soon as the previous game ends, a new game starts without giving you any options. Square moves with the help of the click of your mouse. You don’t need any other buttons to use in the game. The square will move forward on its own and you will have to make it jump over the triangles and jump from different bars so that it can keep moving forward. The music of the Geometry Dash can be related to the classic 8-bit games that used to come for gaming consoles like Nintendo, Game Boy Advance, etc. 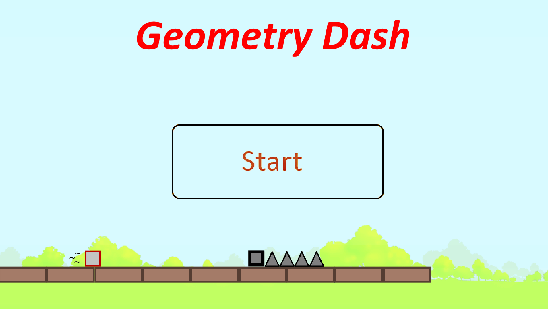 The graphics of Geometry Dash are also somewhat inspired from the 8-bit games. In this game, you might get a feeling that you are playing a classic game from 8-bit. The game has a different game play from the other games that have similar genre of gaming. On both the sides of the game there are advertisements, which cover comparatively a major part of the screen. The game is free and can be played again and again without any delays as it keeps starting all over even when the game ends. If you switch your screen to other app or desktop and then get back to the game, it will resume automatically.